Simply Back to Basics: Joy takes up A LOT of Room! Joy takes up A LOT of Room! Well, I did it. 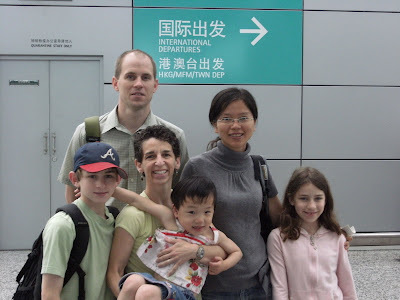 I went to China with my family of four and came home a family of five! My sweet daughter, Megan Ling was received into our family on May 13th, as natural as can be. She seemed pleasantly curious about us at first, and then positively happy, which gave way to joyful as we got to know each other more and more. She is easy going, loving and gentle, and is quickly learning the ways of our lives and routines. Here we are with our guide in Guangzhou, headed to Hong Kong, then home. 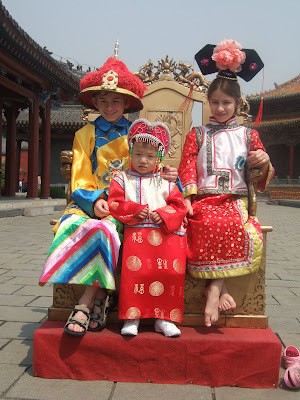 And a photo of my three children dressed as Chinese royalty. 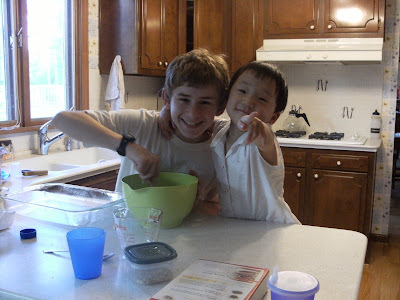 And a photo at home taken yesterday of Megan Ling and her brother baking brownies! Things are going just great for us. Slowing life down to include an active toddler was a necessary and normal piece of this whole journey. It took me a full week to find enough time to get through the pile of mail that accumulated while I was gone. It took another week to simply put away all the things from my trip and the various post trip activities. I still have yet to vacuum any room but the kitchen, let alone dust or clean bathrooms (except for the most cursory of clean ups). I am telling you all of this because I suspect this rings a bell with many of my clients and readers. Typically, people I work with are not inherently disorganized; but rather what I call “Situationally Disorganized”. What this means is that “something”, a significant or life changing event occurs and impacts life in such a way that it is difficult to recover while life continues to pile it on. These events can be both positive and negative (or a mixture of both), such as a new job (or increase in old responsibilities), marriage, separation, loss or addition to the family, a move, illness, injury and many others. It can subtly start when people allow their boundaries to gently erode as they over commit to too many causes. When this kind of pressure builds, most people start to pile things up. I know I started to use my dining room table; first, before the trip to China for packing, then after for disbursement to the rest of the house. This can become a problem in several ways: one, it makes it tough to find what I buried underneath. Two, it is hard to stop doing this because it is so tempting to just keep piling. And three, it is just plain hard to dig out. First, Phone a friend: I accepted the help of the wonderful friends who offered an hour of their time. I did not abuse it and I thanked them dearly. My mother-in-law came and helped me skim the top off the dining room. She helped me sort things into piles (I used a clear rolling cart with three wide drawers to do a gross sort of my three kids belongings) and move them into the right owner's room. Two of my friends offered to entertain Megan Ling for an hour or so while I got some personal and business tasks done. It takes discipline on my part to stay focused during the precious time. One of my friends is in my backyard right now with her, as I write this post. Second, hire help if possible: I have someone who helps me clean, but I decided not to have her come while I was home for the summer with Megan Ling. I have since changed my mind and asked her to come back once or twice a month even while I am home. It is a luxury and a pleasure and I am grateful that I can take advantage of it. This investment allows me to focus my energy on my family without the added pressure of having to do it all myself. It also allows me to let go of the responsibility for a perfectly clean house every minute. I can keep up in-between visits and I know Rebecca will be here soon. Third, say “No”. This is the hardest for me. As I wrote last time, I think I can do everything and have trouble keeping it in check. I am trying to be realistic and let go of any goals that are not in the immediate future or absolutely essential. I will always struggle with this. I so admire my daughter, who achieves her expectations and sets realistic goals for herself. She is an excellent student and is responsible for herself. She does not start months in advance or stress over her goals. She is very private about it and disappears to her room and comes out hours later with a completely redone bulletin board or a handmade picnic set for her Webkinz or an I Love NY Project. She is learning and mastering her own pace and somehow, she keeps it realistic. I strive to emulate her. She is the first to tell me “Mom, you need to relax” and I try (not always successfully) to listen to her suggestions. Fourth, do a little at a time and be patient. Chip away at your projects. Set small goals that you can achieve. Settle for imperfection-good enough. Put your energy where it really matters most. This is where Megan Ling has helped me the most. She is a constant reminder of what is really important. All else pales in comparison to her need for me. I can let everything else go because she needs me now. For others, the important things will be different, but deep down; each person can know what their true purpose is, if they listen to their heart. It speaks, sometimes loud, sometimes soft, but it speaks. This is a long post. I hope I haven’t lost anyone but I certainly understand if you don’t have time to finish reading in one sitting! Click Here for directions to ECC South. Call 858-6800 to hear a recorded message with details on accepted items.